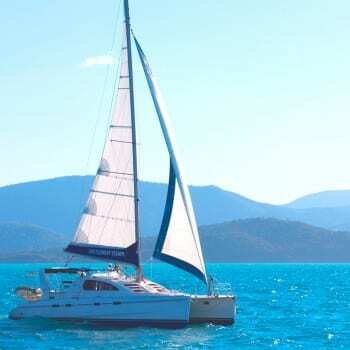 The Leopard 42 sailing catamaran was purpose built for cruising tropical waters and is very popular with overseas charter fleets. The Leopard 42 can sleep up to twelve. Four double cabins with their own bathrooms, the saloon will accommodate another double and two additional small adult berths are available in the forward cabins. All cabins feature plenty of hatches. The ample head room, the generous refrigeration space, the upstairs galley and roomy shaded cockpit makes for very comfortable cruising. Air-conditioning is available at the marina. Suitable for four couples, two families and mixed groups. She will also perform equally well under power alone. Seven of us (dad, mum & five 20-somethings) had a fabulous seven days cruising the islands. Perfect weather (late Nov - early Dec). Thorough (and patient!) induction from the WE ops team. Reliable and useful scheds each day. We even enjoyed the 3-hour $1200 pre-embarkation provisioning shop. The boat itself was just what we wanted: great to sail and no problem if your crew is a bit on the idle side - like mine :) Lots of room to gather for fun - but also easy to find a spot to escape on your own for a while. Would recommend spending the first night on board in port to check on things. Looking forward to doing it all again. Thanks! Very efficient. Excellent briefing and daily advice at scheduling times regarding anchorage choices & passage crossings. A very comfortable and well maintained vessel.